With this headline, “Bitters cocktail bar and restaurant to open at SkySong in Scottsdale,” we see what I believe is the bar district’s camel nose under the tent at the taxpayer-subsidized SkySong office park gulag. And if bar district princess (and city councilwoman) Suzanne Klapp is tweeting about it, you can be sure that Klapp has already extracted a campaign contribution. I note that with a byline of “Special to the Republic,” this is yet another example of press release journalism, crafted by a paid PR hack. The featured “small plates” appear to be a variety of gourmet-sounding popcorn. To “soak up” $15 cocktails. Is this what the taxpayers expected when we were told that we were in the hook for nearly $100 million in real estate costs, infrastructure, and ongoing subsidies to the private developer of SkySong…whose principals also contribute generously to the city council and mayor Jim Lane? I know I didn’t. 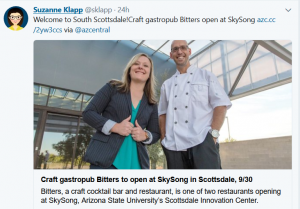 So, far from being the salvation of McDowell Road, SkySong is going to turn into a taxpayer-subsidized annex to the bar district…and a lot shorter commute for patrons from Tempe. I am truly amazed at the female members of the city council and their love of the entertainment district. Just look at the reported sexual assaults in that area since the first of the year. It is unreal. Sky Song remains the creeping “Trojan Horse” for Light Rail entry to Scottsdale. Saw another faux piece by Jim Lane in Arizona Foothills, extolling the virtues of our City, and mentioning Don & Charlie’s, a place most of us have been denied since all the South Beach influence in what was the Arts District and on the East side of Scottsdale Rd..
Next post: Cats and dogs living together, mass hysteria!